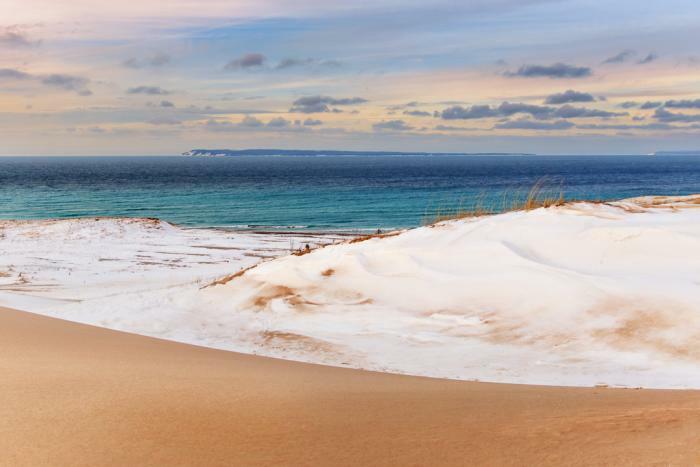 Did you know you can hike at the Sleeping Bear Dunes National Park in the winter? Snowshoeing and cross country skiing are options, too! The scenery (and the serenity) of this season give the park a whole new meaning. Here&apos;s a look at four reasons why winter isn&apos;t such a sleepy season after all at the Sleeping Bear Dunes. Dune vistas and an endless horizon of the beautiful blue water of Lake Michigan, need we say more? Find it at Sleeping Bear Point. This two-mile loop is full of options — including some quicker out and backs. If you want to hike along the beach, take the first right on the trail. If adventure is your second name, continue going straight where you will be rewarded by scenery along the dunescape before entering the ghost forest. (This is not a haunted forest, but something just as cool! Read about it here.) At this point, you can turn around and head back, or press on to complete the loop which will take you through sweeping sections of open dunes. 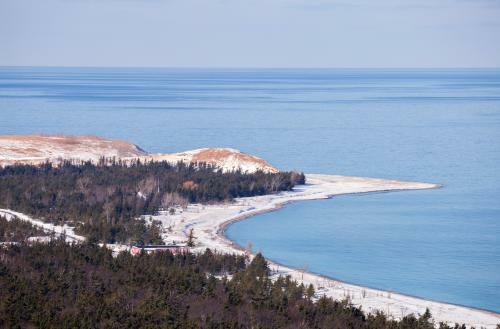 To access this hike, drive to Glen Haven and turn left at the red Glen Haven Cannery Co (Lake Michigan Drive). Take this road past the maritime museum until it dead ends at the trail head. It&apos;s not a song, but this trail is one of the most photographed sections of the park. The Empire Bluff Trail has iconic views of South Bar Lake and Empire, and on occasion, eagles can be spotted there too! This 3/4 mile hike will take you through beautiful mixed hardwoods and over gently rolling hills. Be sure to pause to appreciate the tree-framed view of the lakeshore to the north. Continue onward to the Lake Michigan overlook — where you should be on the lookout for that eagle — and where you can sit down to take it all in. To reach this hike, take M22 south from Empire. Turn right onto Wilco Road, and you&apos;ll see the trailhead on your left. At Pyramid Point, you&apos;ll experience epic Lake Michigan views while standing atop a peak of land. This uphill hike is a bit more challenging, so thankfully it&apos;s only a half mile trek. The lake’s vast array of blues will be on display, and unless lake eﬀect snow is coming down in buckets, the Manitou Islands will standout on the horizon. On clear days, you may even catch a glimpse of the Fox Islands to the north! To ﬁnd this hike, take M22 north of Glen Arbor and turn left on Port Oneida Road. Follow this until you reach the Leelanau Outdoor Center and park at the bottom of the hill. From there, you can hike a tree-lined road to the oﬃcial trailhead. For the more adventurous, the climb up Alligator Hill oﬀers rewarding views of Sleeping Bear Bay. Although this hike is mostly forested, you will also encounter portions of the trail that wind through large sections of downed trees—a result of the devastating August 2015 storm. 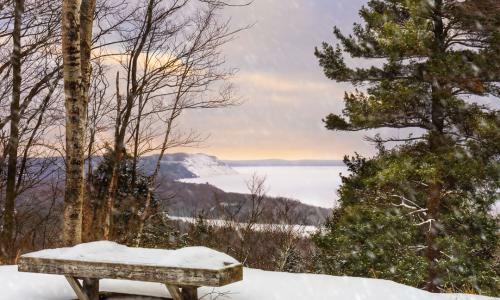 A bench at the top welcomes you to enjoy your well-earned rest as you take in the panorama that stretches from Sleeping Bear Point all the way up to Pyramid Point. The main hike featuring this overlook is three miles long, but for those looking for a challenge, there are nine miles of trails to explore. This hike can be accessed behind the D.H. Day barns. The trailhead parking lot is just oﬀ Stocking Road which can be reached from either side of M-109.